1. In this population, if positive fetal cardiac activity seen on POCUS, only 5% chance of pregnancy loss. 2. If only IUP seen on POCUS, 22% chance of pregnancy loss. 3. Reported accuracies of POCUS for IUP and FCA cannot be taken at face value due to limitations. Vaginal bleeding during early pregnancy is a commonly encountered scenario. The first objective is always to exclude ectopic pregnancy as the cause for symptoms since this can be a life threatening diagnosis. In most cases, this can be done by confirming an intrauterine pregnancy (IUP). However, once you have determined there is an IUP, what next? In most cases, you would now tell the patient they have a “threatened abortion”, meaning they are at risk for having a spontaneous abortion (aka a miscarriage). These also can present with bleeding and occur in 20% of all pregnancies, most commonly (80%) in the first trimester. How do we counsel the patient with bleeding in early pregnancy with regard to their chances of having a good outcome? This study takes a look to see what happens to these patients after having confirmed an IUP on a point-of-care ultrasound. What are the 20 and 40 week fetal outcomes following ED point-of-care ultrasound documentation of fetal cardiac activity (FCA) and intrauterine pregnancy in women less than 20 weeks pregnant with vaginal bleeding? How accurate are point-of-care studies compared to radiologist-interpreted transvaginal ultrasound? 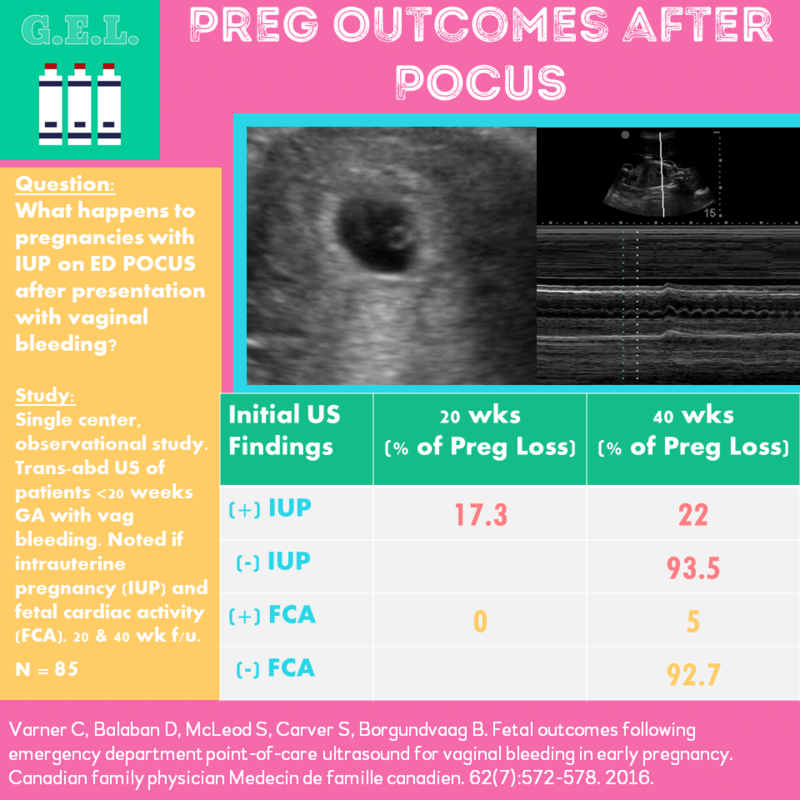 Primary outcome defined as prevalence of spontaneous abortion or pregnancy loss by 40 weeks gestation following ED POCUS documentation of FCA and IUP at less than 20 weeks gestation. Secondary outcome was test characteristics for accuracy of transabdominal POCUS compared to comprehensive transvaginal ultrasounds. Contacted by telephone at 20 and 40 weeks (±2 weeks) to determine fetal viability. If could not be contacted, chart review performed. FCA not defined but presumably when they could see definitive cardiac motion. Single center - the population may be different than yours depending on access to primary care and other factors. Apples and oranges - comparing ED transabdominal to radiologist transvaginal? Not very fair. Rate of pregnancy loss after FCA much lower than prior studies (11.1%, 14.8%). Possibly explained by including some second trimester pregnancies? Did not take into account the age of the pregnancies. For example, no FCA at 4 weeks is not the same chance of loss of pregnancy as no FCA at 19 weeks.